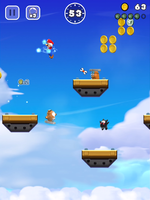 World 6 is the sixth world of Super Mario Run. 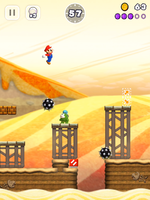 Although its exact terrain is unknown, it contains four levels that consist of the desert, mansion, airship, and castle themes, respectively. This world is available after completion of World 5 and its own completion unlocks World Star. World 6-1 Land of Spikes A desert level with many Spikes. 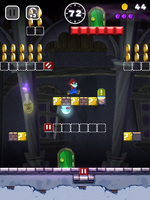 World 6-2 Switch Ghost House A mansion level that heavily utilizes P Switches and ! Switches. World 6-3 Throwing It All Overboard An airship level with many Ninjis and Rocky Wrenches. 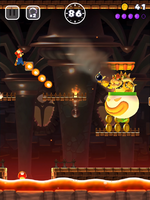 World 6-4 Bowser's Bob-ombing Run A castle level with the final boss fight against Bowser. This page was last edited on February 27, 2018, at 23:08.